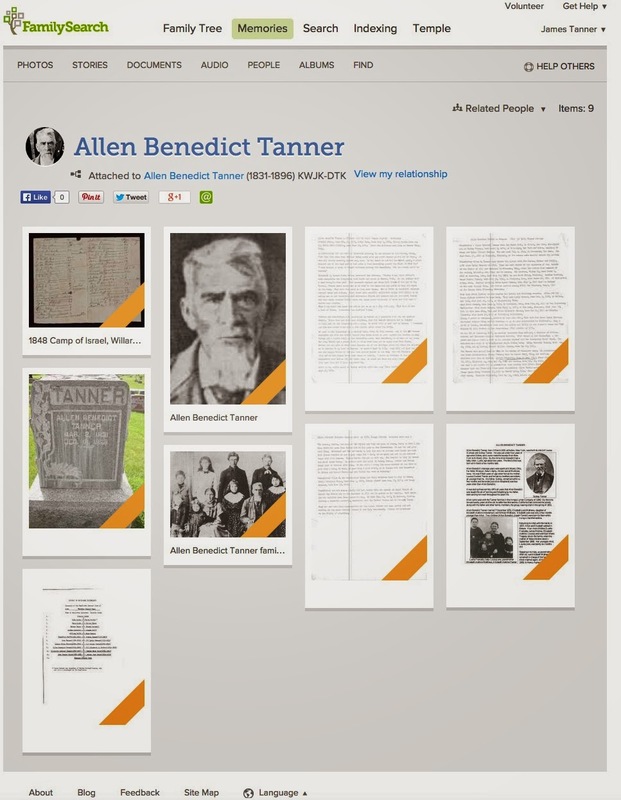 In this case, Allen Benedict Tanner is a brother of my Great-grandfather, Henry Martin Tanner. 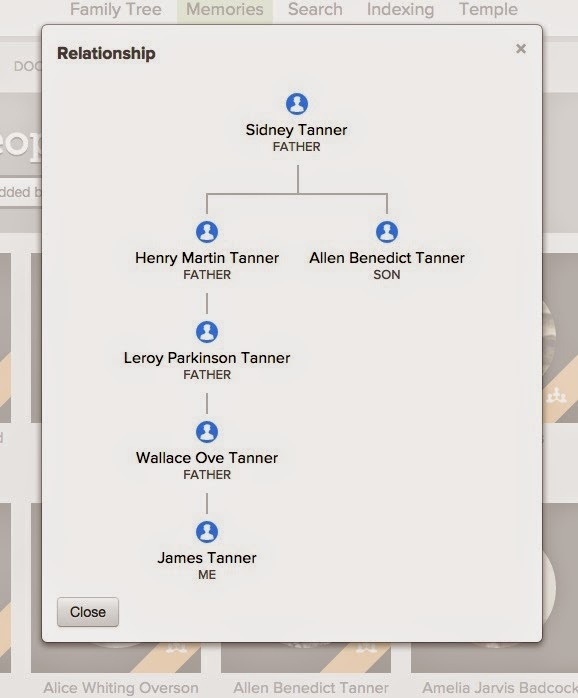 As a side note, it is features like this that make the common practice of banks and other institutions use of ancestors' names and relationships as security questions extremely ill advised. 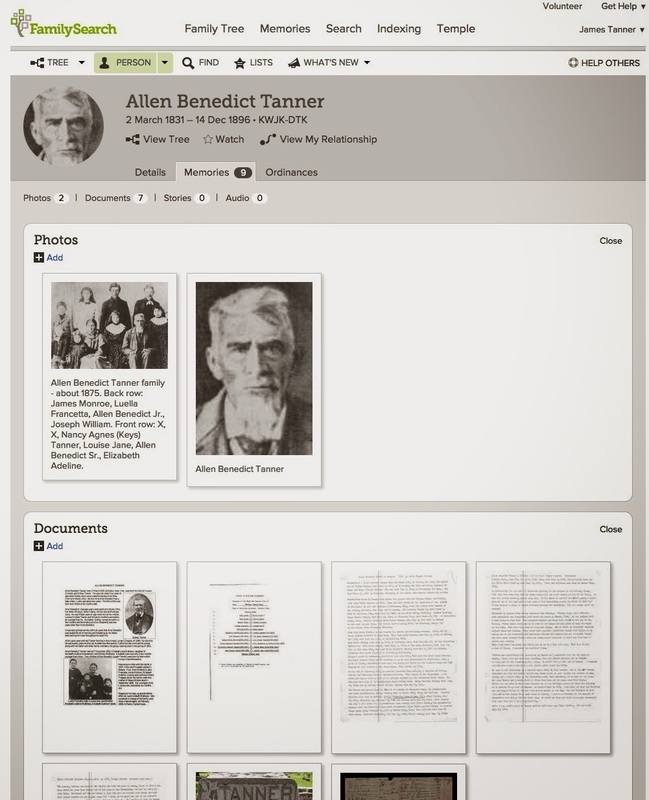 There are some other powerful features of the Memories section of FamilySearch.org that may go unnoticed and unused. One of those features is not too obvious. You can upload old photos for people who you do not recognize and let others identify the people in the photos. The reason this is possible is that photos can be tagged with the place of origin or circumstances of origin by adding a title to the photo. 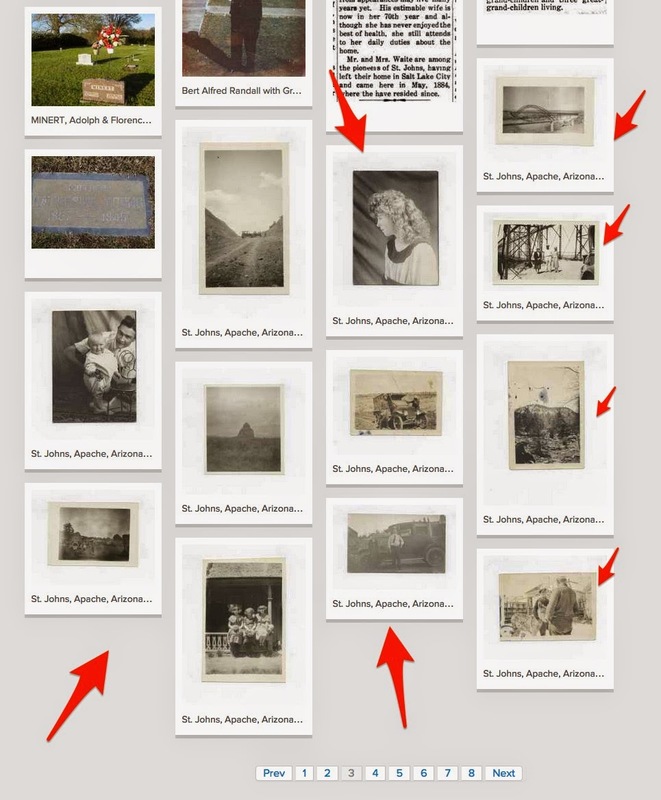 If you are aware of this feature and if implemented by those uploading and tagging the photos, then you may find a priceless photo of an ancestor you did not know existed. Over the past few years, I have written about my Great-grandmother's photography. Margaret Godfrey Jarvis Overson was a professional photographer in Eastern Arizona primarily in St.Johns, Apache County, Arizona. Her father, Charles Godfrey DeFriez Jarvis was also a professional photographer. Over the years, I have digitized many of these photos and put a few of them online. 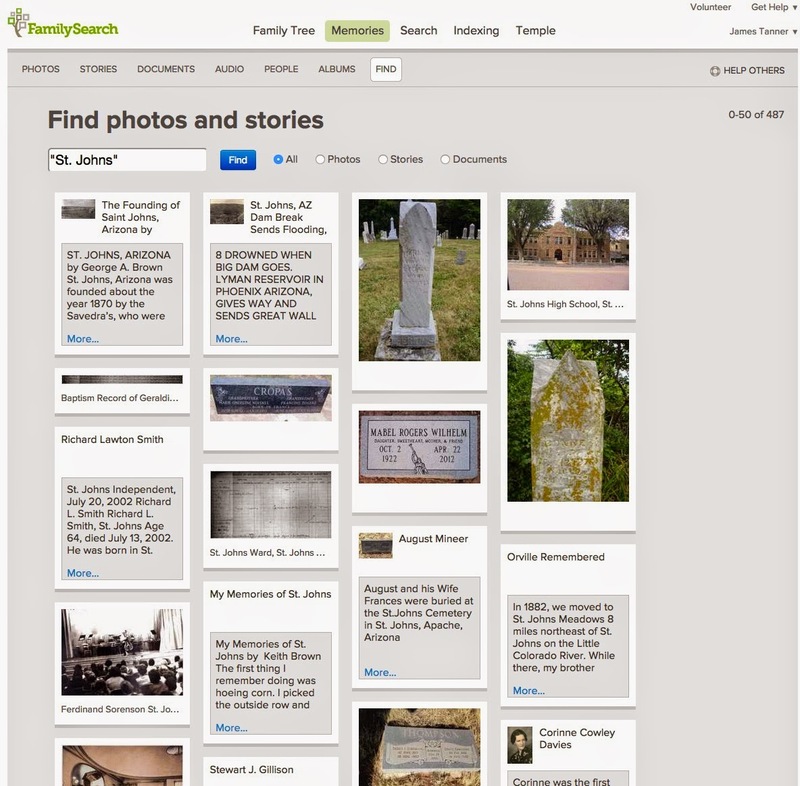 Some of those photos are on the FamilySearch.org Memories website. They can all be found by making a search for the term "St. Johns" in the Find function of the Memories program. 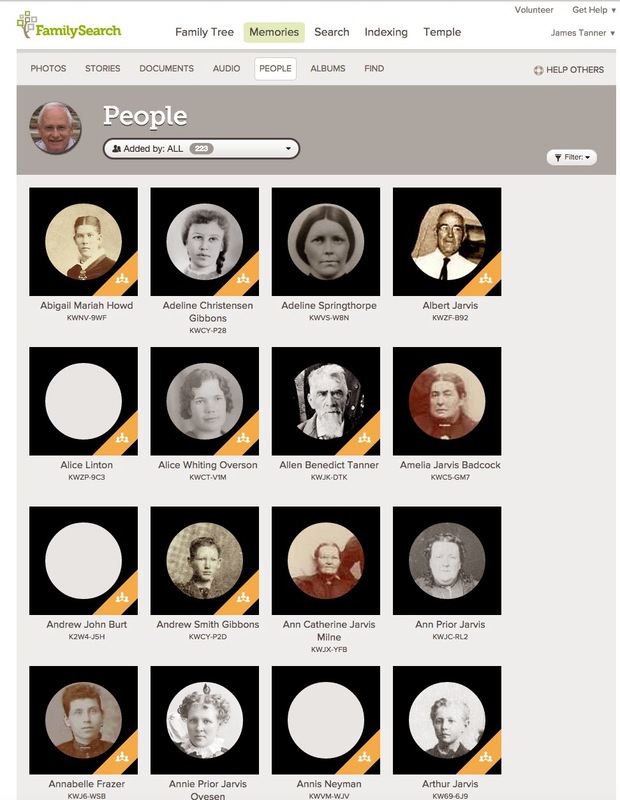 Here is a screenshot of the results of searching on "St. Johns:"
These photos are waiting for people to identify them and claim their ancestors' photos on FamilySearch.org. Searching by the place where your ancestors lived may show you other photos of historical interest to your family as well as photos of your own ancestors. When you search, put the name of the place in quotation marks to get the program to look for combinations of words. When you find a photo, take the time to add identifying information and attach the photos to the right people so that other relatives can benefit from your discovery. If you would like to see all the photos I have uploaded and tagged so far, you can see them by looking at the photos attached to Margaret Godfrey Jarvis (1878-1968) KWZZ-YBN. If your ancestors came from Eastern Arizona, it is very likely there is a photograph in this huge collection. 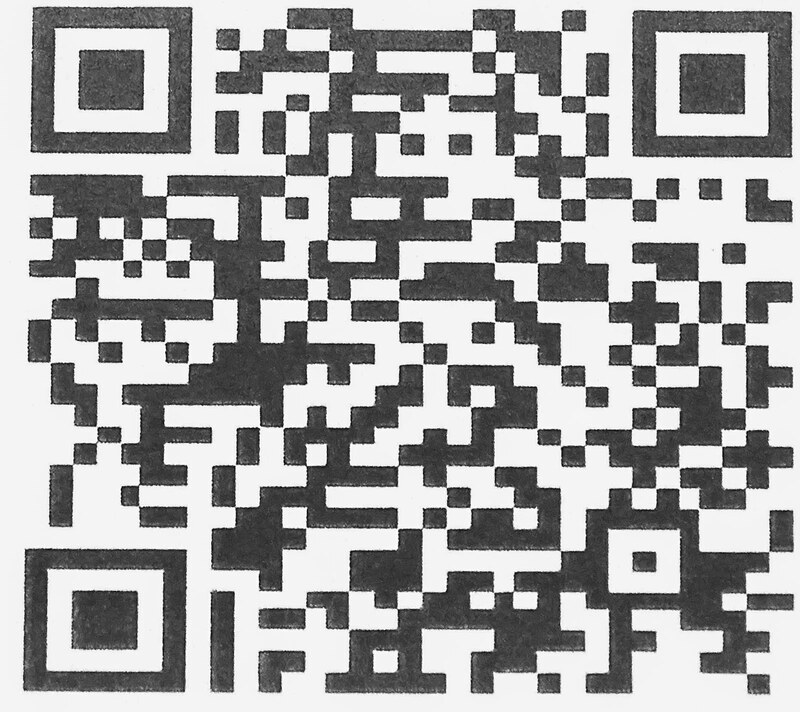 I have only recently uploaded my GEDCOM to FS. I was not aware of this feature. Thank you for the post.